Start off your visit on the 3rd (Wed): admire the natural beauty at Japanese Tea Garden and then snap pictures at Golden Gate Bridge. Keep things going the next day: buy something for everyone on your list at Ferry Building Marketplace, take a leisurely stroll along Fisherman's Wharf, and then step off the mainland to explore Alcatraz Island. 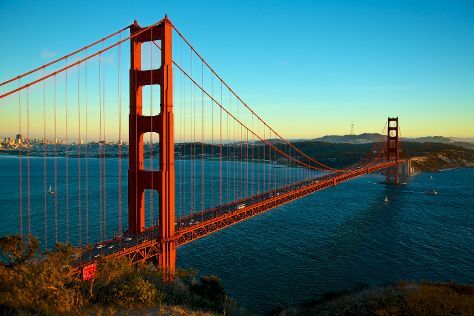 To see maps, ratings, reviews, and more tourist information, go to the San Francisco trip itinerary site . Newark to San Francisco is an approximately 7.5-hour flight. You can also do a combination of train and flight; or drive. The time zone changes from Eastern Standard Time (EST) to Pacific Standard Time (PST), which is usually a -3 hour difference. Expect little chillier temperatures when traveling from Newark in July; daily highs in San Francisco reach 73°F and lows reach 57°F. Finish up your sightseeing early on the 4th (Thu) so you can go by car to Yosemite National Park. 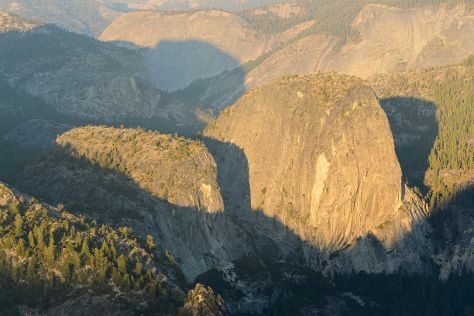 On the 5th (Fri), take in the dramatic scenery at Yosemite Falls, admire the sheer force of Vernal Fall, then take in the awesome beauty at Cathedral Beach Picnic Area, and finally explore the striking landscape at Glacier Point. For other places to visit, where to stay, photos, and other tourist information, go to the Yosemite National Park trip planner. You can drive from San Francisco to Yosemite National Park in 4 hours. Other options are to take a bus; or do a combination of subway, flight, bus, and taxi. When traveling from San Francisco in July, plan for somewhat warmer days in Yosemite National Park, with highs around 83°F, while nights are little chillier with lows around 46°F. Finish up your sightseeing early on the 5th (Fri) so you can go by car to Las Vegas. For where to stay, more things to do, reviews, and more tourist information, go to the Las Vegas vacation planner. Traveling by car from Yosemite National Park to Las Vegas takes 9 hours. Traveling from Yosemite National Park in July, things will get warmer in Las Vegas: highs are around 104°F and lows about 81°F. You will leave for Grand Canyon National Park on the 6th (Sat). Kick off your visit on the 7th (Sun): get great views at Lipan Point, admire all the interesting features of East Rim Drive, and then explore the stunning scenery at Grand Canyon South Rim. Get ready for a full day of sightseeing on the 8th (Mon): trek along Bright Angel Trail. For where to stay, reviews, ratings, and other tourist information, go to the Grand Canyon National Park trip planner. Traveling by combination of car and flight from Las Vegas to Grand Canyon National Park takes 4.5 hours. Alternatively, you can drive; or take a shuttle. The time zone difference moving from Pacific Standard Time (PST) to Mountain Standard Time (MST) is 1 hour. In July, Grand Canyon National Park is cooler than Las Vegas - with highs of 84°F and lows of 52°F. Cap off your sightseeing on the 8th (Mon) early enough to go by car to Durango. Start off your visit on the 9th (Tue): stop by Honeyville, take a tour by water with Boat Tours & Water Sports, and then see the interesting displays at Durango and Silverton Narrow Gauge Railroad and Museum. To find traveler tips, where to stay, and other tourist information, read our Durango trip itinerary builder app . Getting from Grand Canyon National Park to Durango by car takes about 5.5 hours. In July, plan for daily highs up to 86°F, and evening lows to 54°F. Wrap up your sightseeing on the 9th (Tue) early enough to drive to Buena Vista. The Town of Buena Vista is a Statutory Town in Chaffee County, Colorado, United States. On the 10th (Wed), tour the pleasant surroundings at Buena Vista River Park and then let the river carry you with a rafting and tubing tour. For ratings, where to stay, photos, and more tourist information, you can read our Buena Vista travel planner. Getting from Durango to Buena Vista by car takes about 4.5 hours. Other options: do a combination of shuttle, bus, and car; or do a combination of flight, train, and bus. Expect a bit cooler temperatures when traveling from Durango in July; daily highs in Buena Vista reach 80°F and lows reach 49°F. Finish your sightseeing early on the 10th (Wed) so you can drive to Santa Fe. On the 11th (Thu), admire the masterpieces at Georgia O'Keeffe Museum, see the interesting displays at New Mexico History Museum, take a memorable drive along The Plaza, then see the interesting displays at Museum of International Folk Art, and finally get to know the fascinating history of Canyon Road. On your second day here, steep yourself in history at Loretto Chapel and then pause for some serene contemplation at The Cathedral Basilica of St. Francis of Assisi. For more things to do, traveler tips, maps, and more tourist information, read Santa Fe online sightseeing planner . Getting from Buena Vista to Santa Fe by car takes about 5.5 hours. Other options: do a combination of bus, flight, and shuttle; or do a combination of car and flight. Traveling from Buena Vista in July, expect Santa Fe to be a bit warmer, temps between 88°F and 60°F. On the 12th (Fri), wrap the sightseeing up by early afternoon so you can travel back home.